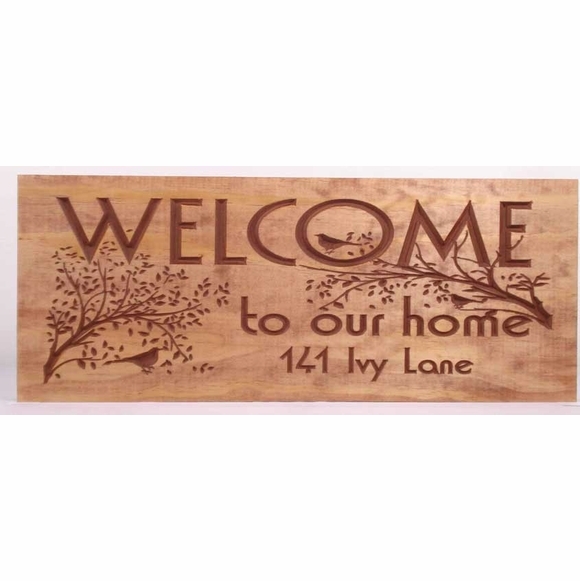 Welcome to Our Home Address Plaque - - personalized with your address. Carved Pine Welcome Bird Branch sign displays a small address at the very bottom. Wall mount. Nature theme plaque made in USA. "Welcome to Our Home" is standard on this sign. Customized with the address you supply and the edge style you select. Solid pine construction with carved personalization and detailed bird and tree design. Modern rustic style. Rustic grain brown finish with clear-coat marine-grade sealer. 18x7 sign holds up to fourteen (14) small characters. 22x9 sign holds up to seventeen (17) small characters. 24x11 sign holds up to nineteen (19) small characters. Please make sure to order the sign size that is big enough to hold your address. (NOTE: you do not have to fill the entire input box.) Leave the input boxes for other size signs empty. Four edge styles: standard (as shown in sample), roman OGEE edge, round over edge, or chamfer edge (see small image).